Blimey @Melcavuk- this and the accompanying modelling thread that I've run out of likes for are a bit good, 😳 I'm not sure how I've managed to miss them (yes I am, I've been crazy busy with real life recently and most of my hobby/internet time has been Necromunda focused) - do you mind if I add links to them to the OP of the Ironweld Arsenal discussion thread?  Sounds good, its a slow progress but about a month away from playtesting so its exciting times. I can see that a lot of thought and effort has gone into this, but it doesn't feel anything like what Ironweld are like as depicted in current lore. for example, you make there quite clear class divisions, and the laborers seem expendable. while in the book Spear of Shadows by Josh Reynolds, all Ironweld are taught the language of the duardin, which implies a certain level of additional learning, which combined with the fact that they are supposed to be master crafters and smiths, who are never expendable, I doubt 'laborers' would be considered expendable. While nepotism and advancing due to family ties also seems to be seen as a bad thing in the Ironweld. In addition, they seem to recruit from the regular populous rather than interal families, that being said there are families that have a tradition of joining the weld. Further more those soldier’s who die maning cannons have their name enscribed upon that gun, which implies a certain level of importance and honor of being a gun crewman. 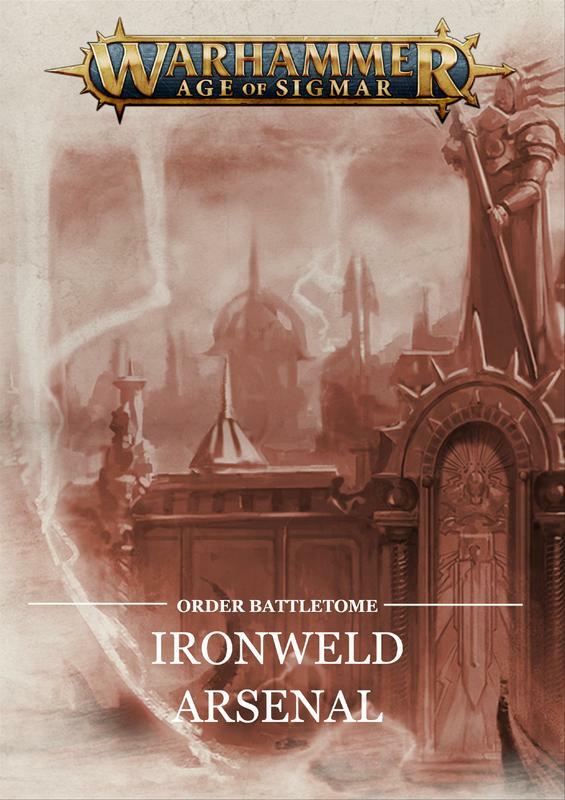 As for look, it seems the Ironweld is going to be the ones keeping the empire look (while free guild change) as the cover art has the Ironweld character in very empire-looking clothes while the freeguild character has a new look. Based on both spear of shadows and war claw. I also feel your cavalry striders are too close to Admech dragoons. The lore calls their non-tank/copter mounts are gear-driven beasts, which i think means that they will look more like mechanical animals, likely with metal jaws and claws, then simply legged machines. 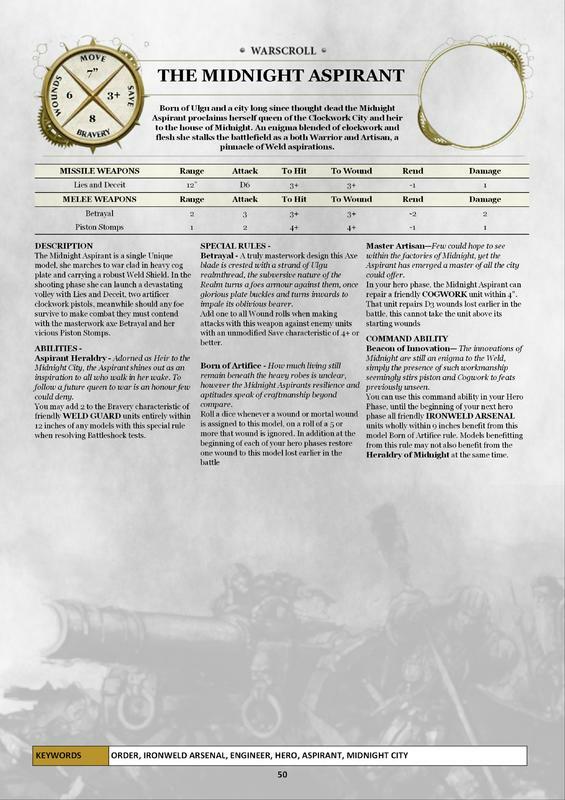 I also doubt Ironweld will be anything more then a sub-faction within the free peoples warscroll thus new (Ironweld) stuff will likely be limited. That being said I would love and hope they are expanded more upon to the point they can be played as pure Ironweld and do decently. I personally think the Idea of big guns (and artillery), (steam/clockwork)tanks and (steam/clockwork)helicopters should remain the focus of the faction, everything else should be support troops (even if they are battle line) I think. I also think the Idea of mixed human-duardin should be important. I'll go into detail in another post. By looking at those kingdoms who were outside of the walls of Azyr during the seperation I looked into evolving the armies of these as seperate factions rather than simply one minor facet of the Azyrite armies. 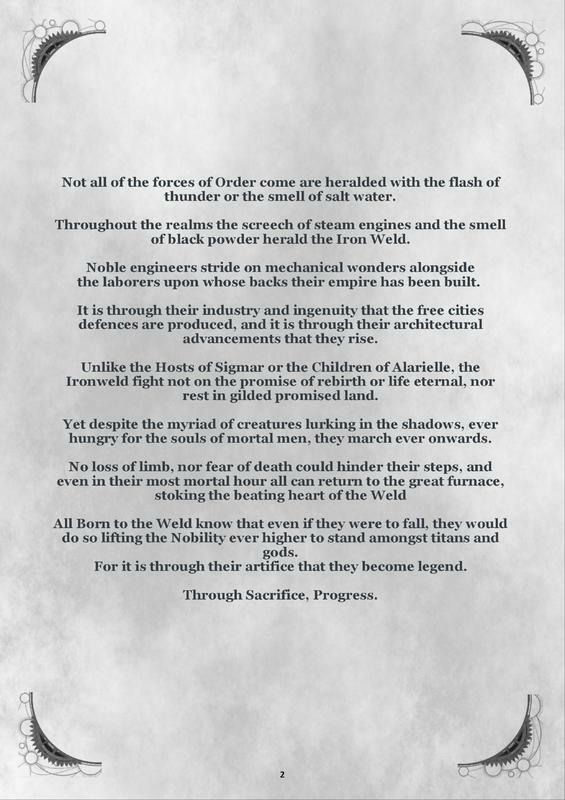 Since I think the weld are supposed to be fairly well-educated members of a city, in that the Ironweld has spent a fair bit of resources teaching them duardin, and most like how to read and write, as well as how to make and operate their relatively expensive equipment. 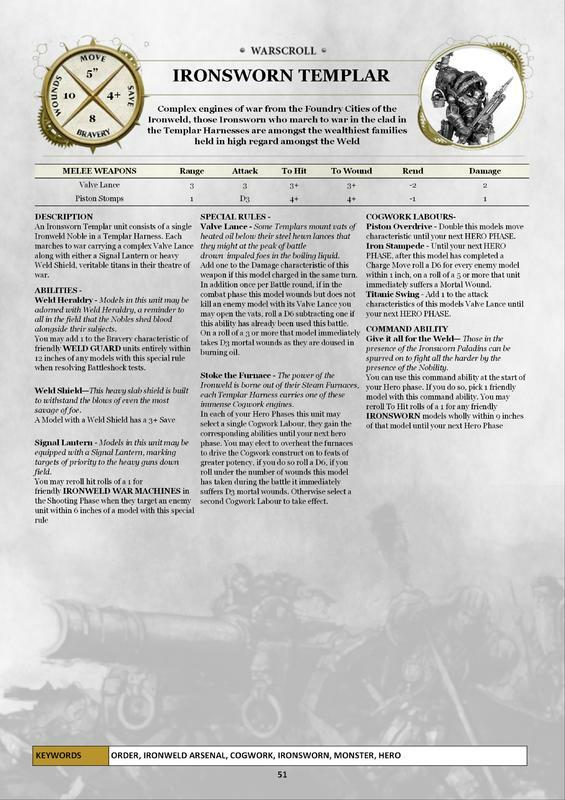 I, therefore, think Ironweld should not get any real chaff units (middling units at worst), why would the Ironweld use their relatively expensive members as chaff when free guild is both cheaper and more willing (and free guild are already a gunpowder armed chaff army anyway). However I do think there is a possibility for Outriders and a new unit which are basically dismounted outriders to have both Free guild and Ironweld keywords, the fluff being they are free guild members given the necessary training to use more complex weapons and thus are honorary Ironweld members and are more likely to fight alongside Ironweld. the first should be ‘Ironweld sappers’ (or perhaps called ‘combat engineers/pioneers’), armed with repeater handguns, regular blunderbuss, and grenade launching crossbows (like in ww1), as well as sachel/demolition charges (which could be thrown in the hero phase) and entrenching tools (sharpened shovels and pick-axes). Armor should be decent but not too good (5+ at best), standard battle line if Ironweld. These gies are a mixture of humans and duardin, though mostly human. These gies are young Ironweld members deployed to build defencive works and blow up obstacles (includeing the enemy). A ‘caster’ type unit, it could use casting type mechanics to summon/build terrian features (in a similar way to wild woods), but its not magic so it can’t be blocked, but had to be placed very close to the unit. The sprue can also be made into the Ironweld’s other infantry unit (which I’ll call Ironweld grenadiers). Terrain they can ‘build’ can be trenches/gun pits which add cover to friendly units (adding to any existing cover they may also be useing), aswell as laying ‘minefields’ (can blow up any units/etc that enter it, even friendlys [unless an engineer or sapper is within x inches])and ‘barbwire and cowtrop fields’ (which just slow the enemy a lot, but can give them a wound per model on 6/5+/-/1), this unit’s main benefitt is the ability to possibly change the battlefield, aswell as an ok (if a bit slow due to the weight of equipment and short range) infantry unit. Basically fantasy version of this gie. The second should be ‘light gun sections’, basically 1-3 light artillery pieces. A new kit, allowing for a Gatling gun type, a light mortar type (or perhaps light rocket), a infantry cannon type and velocity cannon. Small crews and overall low wounds, these gies allow a player to make a true gunline/artillery park army. The gattling gun will basically be a handgun with more shots (16” range, 3+ to wound, -1 rend, 1 damage), rocker/mortar will be a weaker hellstorm (2 shots instead of 3, and 4+ to wound, D3 max wounds), infantry cannon will be hellblaster stats but less shots (as its more like a small organ gun, D3 shots, rather than D6, also 4+ to wound), the velocity cannon meanwhile will a low caliber high-velocity cannon, designed to kill monsters, 1 shot, 3+ to hit (high velocity guns are generally quite acurate), 3+ to wound with -2 rend (designed to pen the armor of monsters and dragons) 2 damage (as its a small shell). The unit (well crew) will be combined with the gun (in the stats like modern artillery) and be armed with pistols (both for regular shooting an melee) can be ungraded for crew to be armed with repeating pistols or handguns. Gyrocopter, same as is but with upgrade sprue for more weapons options (rockets), becomes battleline if general’s mount is a gyrocopter. Steam tank, changes already detailed in ‘light steam tank’ for turret, and tracks/wheels. Also more options for hull cannon, new upgrade sprue also adds option for assault tank. Assault tank, steam tank but no turret and a larger hull gun. Duel kit with light tank, Ironwld carrier transport (10 passengers), can take in units (so a unit of 3 can carry a unit of 30 infantry, or tow 3 guns). Lastly the 2nd part of the sapper’s kit, Ironweld grenadiers. Smaller backpacks and perhaps different heads. They are armed with the same weapons (but can also take long rifles [all models], blunderbuss grenade launchers, steamthrowers (like flame throwers but steam). Also have pistols and all have swords for melee. Still have demolition packs. Basically more elite sappers with less kit to lug around but no terrain abilities. Slightly more duardin then sappers. this allows for mass tank, mass helicopter and mass artillery builds, aswell as mixed forces. Those seem interesting but radically different to what I am trying to do here. I think it would be interesting to see what you can come up with in regards to those plans but in general the concept of more Industrial Nobles/serfs has been largely well received and I am proud of what we have managed to create. To take such a divergent approach into armoured company (40k term but apt) at this stage would move me entirely in the opposite direction of where I would like to be. That is not to say the approach we have taken is “right” but it is our imagining of the Weld. My named character build and the personality behind the Midnight City I'm excited to see what the Midnight Aspirant can do on the battlefield, a decent force buff in terms of resilience she is pivotal in getting the army across the battlefield. My original monstrous walker for the army, felt like the most natural of generals as its the model that started it all. Heraldry of the Midnight City - Allows friendly Weldguard within range to ignore wounds or mortal wounds on a 6. 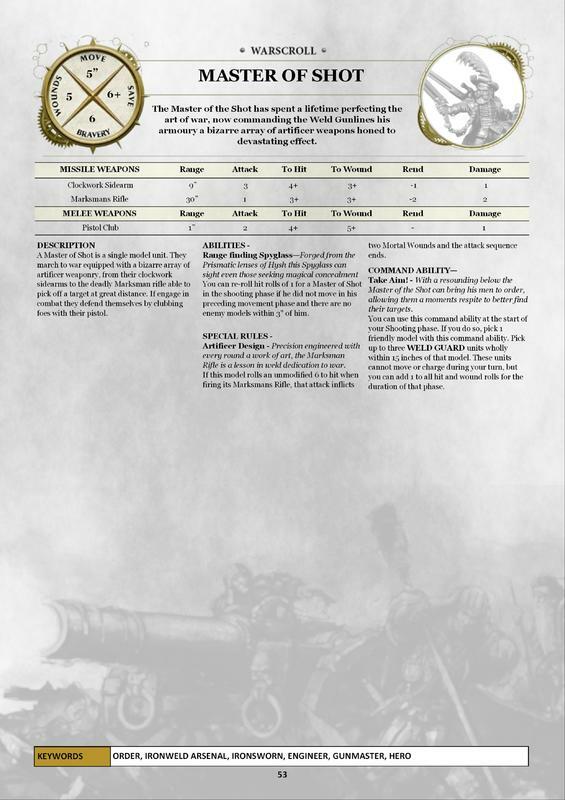 A decent backfield general able to provide buffs to the less mobile units within the army, his command ability works well with the Riflemen unit within the army and he makes a good choice to occupy the Cogfort. Weld Militia x 10 (90) - The first of the infantry warscrolls I had devised, they are a back field support unit who can be used to replenish wounds on the Helblaster, lacking in armour save but cheap and with reasonable firepower they will form a gun battery alongside the Helblaster. Weld Riflemen x 20 (200) - Biggest unit in the army and the last one to be painted, their pressure rifles provide a short optimal range but when combined with the Master of Shot can be a serious threat. Weld Phalanx x 10 (100) - The only infantry unit in the army that wants to join the Cogworks in combat, best on the defense their aim is to secure an objective an repel any chargers seeking to take advantage of the other units weakness to melee. Cogstrider Lancers (120) - Midspeed assault unit with some pistol shooting, they are the flanker unit of the army able to run and shoot in the same turn. These will provide the combat support for the Templar and Aspirant when they reach combat. Lethal on the charge but not much after that they are meant to finish a combat in the turn they charge. Ironweld Helblaster Volleygun (120) - A classic unit of the Empire, now with a redone Ironweld Arsenal scroll able to put serious fire down the field without risking its crew dying and leaving just an expensive paperweight. New temporary cover for the battletome borrowing on some existing Hammerhal artwork, and considering the potential for purchasable defensive scenery in lieu of endless spells, from palisades to embedded spears, gyrocopter scouts and field surgery etc. What do people think? 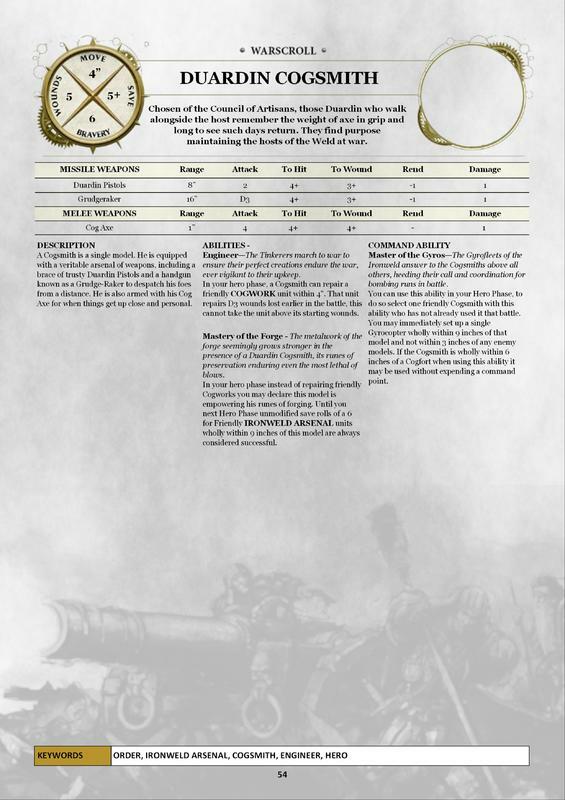 Reworked the Cogsmith warscroll including a new command ability to summon in air support from a Gyrocopter, his revised scroll now clocks in at 120! When God of Gods, Master Craftsmen and Smithy of Azyr Grungi first stoked the fires of the foundries he started an industrial revolution that spread like wildfire across the Realms. From every corner of the far flung reaches came a tide of craftsmen, smithies and artisans that they might study beneath the master and learn even a sliver of his prowess to take their peoples innovations forward into the new age. Mortal and God alike, and all those that fell between made the pilgrimage to the forges of Grungi, toiling hard day and night as apprentices to take the smallest amount of the Duardin Gods workload away from him that he might have time to vital impart knowledge to their kin. Whilst many left Azyr once more having learnt enough to provide their people advancements to serve them over the coming centuries there were those who instead sought to stay behind. They were the most loyal, most dedicated of the apprentices of Grungi, yet even their number began to dwindle as age or ailment wore down once deft and skilful hands and dulled their minds to the new learnings to be imparted. Amongst those remaining but a handful could resist the attrition of age, those born of divine heritage of possessing power enough to rival the demi gods of the Realm, it was then as the numbers of the mortals grew ever slimmer that these divine beings came into power of their own. In each other they found a strength of unity of purpose, to have toiled alongside each other the long centuries there was a certain (if at time begrudging) respect shared between them. And though none could rival the true master of the forge they came together to pool their knowledge into a Pantheon unto themselves, that they might travel where Grungi could not to share his learnings with those they had deemed worthy. It was in this Golden Age that the Pantheon of the forge was formed, born of Duardin, Men and Aelven demi-gods and artisans of their craft. Though such timeless beings called Azyr home they often travelled beyond the city under many guises , each seeking out different cultures and known under a hundred names their teachings can be used to perhaps shed some light on who these divine artisans had once been. To the scholars, philosophers and warrior mages came Askror, the Golden Prince. Once hailed as the Demigod of Hysh and credited to be the found of the Factory City of Cor Temporis. His teachings focused around the arts of Metallurgy and Alchemy, it is said that his visage inspired the golden idols found in the now forsaken pyramids of the tribes of Ghur before their wild and unruly ways slighted the more scholarly of god. It is perhaps this rebuke by the ignorant savages of the greater realms that lead him to seek refuge amongst the monks and scholars that made up the populace of Hysh. To the innovators who sought progress without hinderance of morality or mortality came Dammik-Morr, Demigod of Shyish. It is said he had once founded the fortress empire of Cor Maledictus before the headsmen of Nagash sought to claim him as their prize, it was this then that spurred the darkened God to seek refuge in Azyr, ever looking over his shoulder for the armies of Death seeking to drag him to the Oubliette. His talents focused around the macabre arts of Bonecraft engineering., utilising the one thing in abundance in all the Realm to engineer his creations, death. Known to be cold and distant, ever paranoid since his banishment from Shyish by Nagash, though he sought sanctuary within Azyr but never fully integrated. At odds with both the living and the dead his followers share his sense of isolation when outside of the heavy mists and comforting macabre atmosphere of Shyish. In the hardy and desolate plains of Chamon came Rok, the Mason of the Iron Mountains. Hailed by the Duardin as one of the lesser Demigods of Chamon, and founder of the mountain refuge of Cor Esoteris. In all his guises Rok has been depicted as volcanic in appearance and temperament, ever coursing with the power of the Esoteris volcano in which is shrine had been founded. He built up a fierce reputation for acts of violent destruction to rival the titans of destruction, able to harness the volcanic energies to create magma cannons and explosives to rival even the hammer blow of Sigmar. The roaming nomadic tribes of Aqshy speak of the god Grongar, the Living Flame. Known to them as the Light of Aqshy, and founder of the artisan spires of Cor Insendires. One of the more arcane inclines of the gods it is said he imparted the powers of Fire shaping to his followers, able to summon and entrance elementals of the flame to do their bidding and fight wars without have risking their own live. An arcane smithy and master of the runic forges the beating Forgeheart of the cities of the modern Ironweld still bear the mark of Grongar, a reminder to a distance past that for many has slipped from memory. Perhaps one of the most remarkable came the Aelven demi-god Marak, The Steel Vinelord. One of the many Demigods of the vibrant landscapes of Ghyran, founder of Cor Vivistus. Able to coax and grow metal as though it were a living thing without ever leaving the scar of industry on the fragile skin of the realm he could conjure whole cities that weaved and coursed through the forests in blissful synergy. The chronicles of the Living City claim he was once to be a suitor to the Goddess Alarielle herself but instead was rebuked as she found him to be as cold an imitation as the metallic vines he cultivated. It is rumoured this heartbreak shattered the fledgling demigod, falling to his knees amongst the forest he buried his hands amongst the dirt and wept tears that coursed as a river of metal. Many credit the Ironbark forests having sprung up from the tears shed in his years of mourning, coursing with the power of the young god, indeed even in the modern realms shrines to Marak can be found in many of the Ironbark groves, a testament to his lasting legacy amongst the populace of Ghyran. Finally came Emmanuel, The Forgotten One- Human Demigod of Azyr, Shepherd of the lost and unloved. Founder of the Fractured Welds he sought to unite hundreds of states abandoned by the other gods those his kin had once taken under their wing only to be disappointed by their failures and left to fend for themselves defenceless against the many dangers of the realms. In this modern realms Emmanuel is the only demigod who still shows his face, and even then only at the most dire of times. Seen in many a guise from the haggard traveller to the lone soldier defending caravans of refugees, it would seem he has never truly relinquished his task of shepherding those most needy of souls. For an age the divided empires of the Ironweld each grew and flourished, though once formed of a common school of thought each god sought to impart their own personal teachings on an empire that would stand testament to their greatness and a legacy that might outlast them within the realms. This petty rivalry between the pantheon spurred each to spread their knowledge far and wide, imparting all they could to any they saw as worthy in order to outdo their kin and gain and following the dwarf any of the rest of the Pantheon. Such thoughts however were simply short sighted, the competition between the gods did not go unnoticed by the growing cultures that they had cultivated, their mortal empires instead interpreting the rivalry as another of their divine teachings, each seeking to outdo those who might encroach on their growing kingdoms, it was then unfortunate that conflict had bored its way into the very central foundations of the fledgling Ironweld empire, bestowed from flawed divinity there seemed little to steer their followers from an increasingly hostile road. In this Age the pantheon continued to flit from Azyr to the outer reaches of the Realms, often spending years away from the forges of Heaven that they might wander amongst those who revered them above all else. These trips served little more than to please the egos of the divine and yet with immortality there is often little more to do than service ones own ego. It was then, when news of the passing of Grimnir reached the Azyrite city that the Pantheon of the forge were all found to be absent and perhaps fortunately so, in his rage and mourning the great god Grungis wrath seemingly knew little bounds. Some claim that the Duardin Gods howl of grief shook the very mountains of the realms, coursing as though a hurricane through every gate that led to the Realms of Heaven. Legends even tell of the first Cogforts of the Ironweld straining against this relentless force of sorrow, bending against the wind before pulling themselves from the very earth that held them that they might escape it. Grungis wrath erupted upon the blossoming factory districts of Azyr that had sprung up around his mighty forge, tearing through timber and masonry as a force of nature as his very footfalls shattered the cobbled paths that wound through the district. When sorrow overtook wrath the wounds the God of forge had wrought upon the forges of Azyr were grievous, once the heart of an Ironweld empire there was little to be found but grief and devastation in the city of Heaven. From their distant travels word reached the Pantheon of the Forge of Grungis act, perhaps interpreting the devastation as some personal slight, or fearing reprisal for their absence during his grief, each knew that their return to the Azyrite city was no longer possible indeed with so little remaining of the forges they had built there the city was simply no longer the home they had once forged. It was with heavy hearts that the Pantheon instead retired to the capitols of their Factory Empires, each choosing to take seat upon the greatest shrines to their glory that they might steer their empires individually as all thought of unity had been shattered in the forges of Azyr. In these days, with heavy hearts the Cogforts came to dominance, each God fearing the wrath that Grungi might still bring down upon them could never truly feel safe in cities that great God had known of. Instead they cultivated mighty fortresses of stone and steel that might wander the Realms, ever gaining distance from the heart of Azyr and the God they had abandoned in his time of need. Whilst to the Gods these ingenious innovations were a method of flight from sorrow to their mortal descendants the Cogforts were weapons of immense strategic value, fortifications able to carry garrison and armaments to distant battles and deployable within mere hours rather than the weeks it would take a foe to assemble a ramshackle defence. Each of the young empires sought to use their new arsenal to fuel rapid expansion, in the shifting plains of Hysh the young House of Oran founded the city of Cor Temporis, formed of hundreds of Cogforts walking in tandem, towering high above the mountains as it made it way across the Realm. In Shyish Dammik-Morr sought to raise an empire that might protect him from the ever growing forces of Nagash, surrounding himself with Cogforts in their dozens that they might form some bulwark to slow the advance of the ever patient God of death. With every passing decade new cities and empires sprung up in the name of the Pantheon of the Forge, each a legend and innovation in their own right, yet in Azyr once heart of the Weld there were those who sought to restore the workshops that had been destroyed, under the teachings of Grungi alone the Azyrite houses of the Ironweld were formed. Played some fantastic test games of my work in progress Ironweld Battletome against a flesh eater courts army today. In the first match I managed to get utterly savaged by my opponent, baited into spending far too long fighting ghouls and horrors who kept respawning and blocked out of range of his courtiers (16 inch range average in a shooty army is incredibly limited) we did note however that my initial Riflemen scroll was a worse and more expensive handgunner, increasing the to wound to 3+ for subsequent games making them far more effective for 100 points. Having found my footing after the first gamed and played around with artifacts the units began to synergise well, with my Master of Shot utilising his (freeguild generalesque) command ability to buff the riflemen into a fieresome barrage and not being afraid at throwing the Lancers, Ironsworn Templar and Tank all into combat. 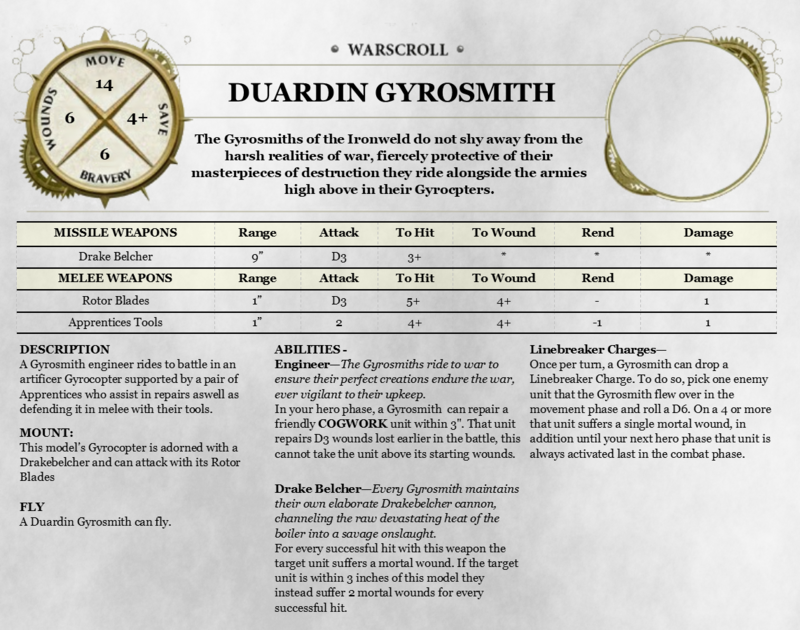 Reworking the unit roster slightly the Tinkerer on Cogstrider has now been replaced with the Duardin Gyrosmith, bringing the Gyrocopters back to the fore. Ironsworn Paladin - Combat hero, medium fast, mortal wound output in melee with the ability to inflict mortal wounds at both start and end of combat phase. Mid weight, non monster, capable of both a 3 up save and being repaired by engineers. Cogstrider Lancers - Impact unit, medium fast, high damage on charge weakening to a lessened state in subsequent turns, used to break lines but will need to win a combat fast as they dont do well being bogged down for long periods of time. Coghauler (all 3 varieties) - Impact mortal wounds on a charge, in a pinch are more than capable of running over lesser foes or performing a combined charge to flatten midweight foes but dont do well in prolonged combat.